Collagen 6a1-cre+ (Col6a1-cre+) cells are present in the ankle synovium and the aortic valve leaflets in the heart, where they colocalize with cardiac valvular interstitial cells (VICs). Representative images of ankle joint and aortic valve leaflets from Col6a1-cre;R26mTm/mG mice (A) indicating cre-mediated GFP expression. Representative heart transverse sections stained with H&E and Lillie’s trichrome staining from WT and TnfΔARE/+ mice (B and C). Heart rate (D), cardiac output (E), ejection fraction (F), aortic peak velocity (G), and QTc interval quantifications (H), measured by ECG and Doppler echocardiography in 4 months. WT and TnfΔARE/+ mice as indicated (n = 29 mice per genotype), Student’s t test, *P < 0.05, **P < 0.01, ***P < 0.001. 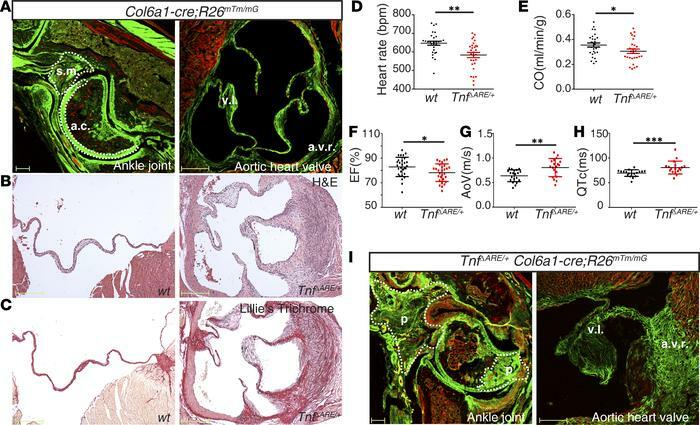 (I) Representative images of ankle joint and aortic heart valve leaflets from TnfΔARE/+;Col6a1-cre;R26mTm/mG mice showing increased number of GFP+ cells in both the inflamed ankle joint and the aortic valve (D). Scale bars: 200μm. s.m., synovial membrane; a.c., articular cartilage, p, pannus; v.l., valve leaflets; a.v.r., aortic valve root; CO, cardiac output; EF, ejection fraction; AoV, aortic peak velocity; QTc, time from the start of the Q wave to the end of the T wave on the ECG.